I will take you today to the South of France. In the province of Uzes, specifically in Garrigue, where young Valerie d'André grew up with the scents of rose fields and fig trees. We were having our hands massaged as she spoke to me of childhood memories and how her sense of smell was developed. Growing up and exploring the world, she would often miss home. And so she decided to bring with her the scents she knew so well. Tucked in between a leather and ceramic pendant, the scent of roses brings her back to Garrigue. I told her I was partial to the Lavender and Citrus, which is fondly called Along the River. "It could be because of a certain childhood memory that makes you like zests. ", Valerie told me. Our preferences for fragrances are often evoked by the things we use to smell, eat, and do as we grow older, she shared. Our sense of smell is so amazing at remembering that even if our brain to not particularly recall that memory, our sense of smell can immediately trigger emotion from that memory. I particularly feel feminine when I smell anything floral as it reminds me of my grandmother preparing in front of her vanity. Valerie gave me the story behind the Along the River. Her singsong french accent was like music to my ears, a nice combination while my tired hands are massaged with the Along the River Hand Cream. "The lavender you smell is very unique and light for it is actually an aquatic lavander that pairs with water mint and lemon." It's unlike I've tired before and there is actually a peppery note to it. It is fresh and almost cooling to the skin. 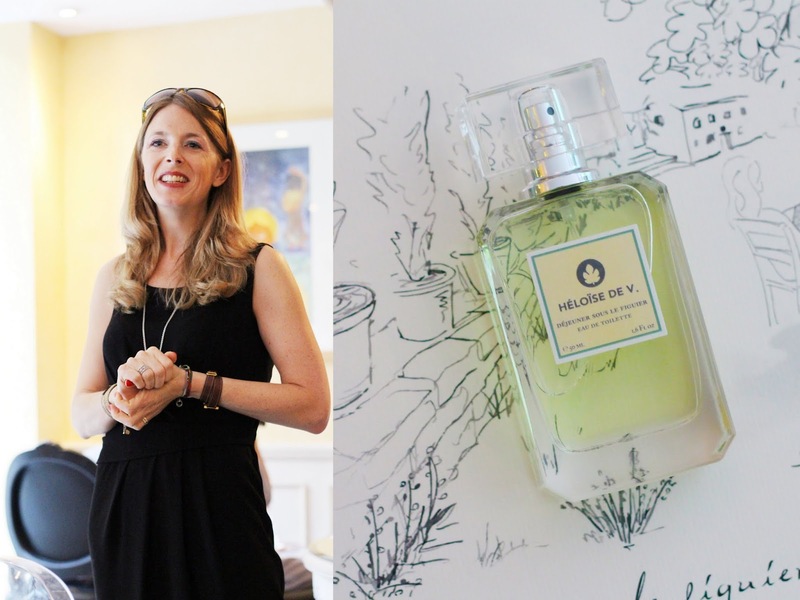 Heloise de V. (EHL-oh-ee du Vee) is not your typical run-of-the-mill fragrance brand. It is bringing a piece of woman's heart to the world. Valerie's vision is to keep memories alive through fragrances as it vividly captures emotions and details far longer than any camera lenses ever will. You can definitely feel the love from the lilt in Valeries' voice as she spoke more about Heloise de V. and we couldn't be more enthralled. I came in quite a bit early at the event, I had the time to take a lot of photos of the beautifully styled Bizu showroom for this intimate gathering. There were fresh flowers, elegant furnishing. 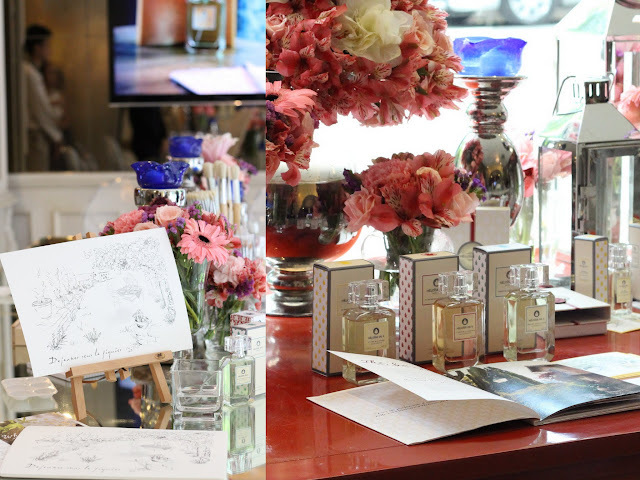 The mirrored table had aromatic inks that will be used for the watercolor workshop. 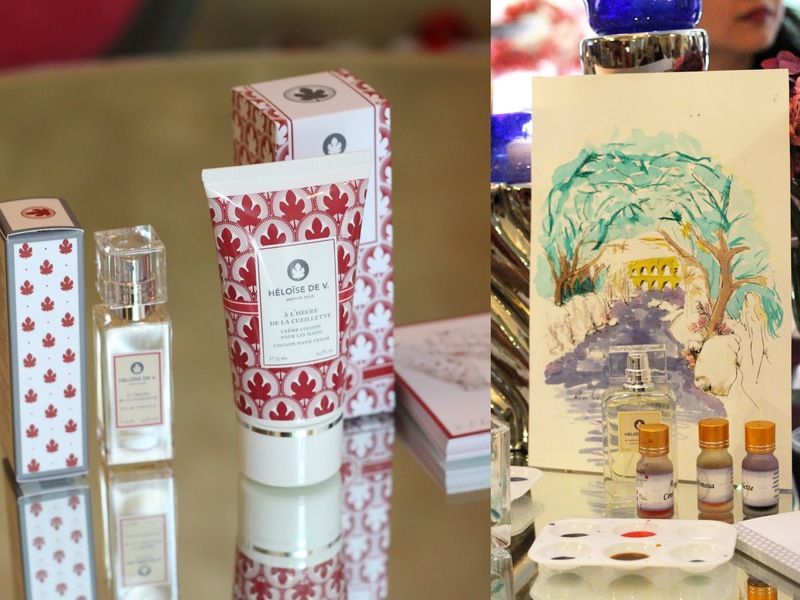 Valerie brought these inks from France as she finds watercolor a calming activity. She wants the men and women attending this event to touch point with their creative side. What did we watercolor? Artworks inspired by each Heloise de V. fragrance cards. There's Lunch Under the Fig Tree, A Time of Gathering Rose and Along the River. To tell you more about the frangrances, I can tell you right now that I love all of them. My preferences for scents run in the more natural, fresh, and zesty direction that Heloise de V. managed to capture. Lunch Under the Fig Tree or the Fig Fragrance captures the burning Summer sun of South of France as on sits under the shade of the many Fig Trees in the area. It has deep green notes and a slight sweetness reminiscent of its ripened fruit. This scnet makes me think of woodlands and shrublands seemingly as if you'll find a group of fairies behind you. It feels authentically like nature. A Time of Gathering Roses or the Rose Fragrance exudes elegance. Like fresh morning dew and you feels and smell and even taste everything. This paticular scent definitely feels like a fresh picked rose with every spritz. Freshness as its finest with a unique aroma of flowers and herbs that are only found in Garrigue. Along the River or the Lavender Citrus Fragrance is my favorite. A lighter and peppery scent of lavender are found riverbank of Garrigue. Blended with the untouched natural surrounding and the crisp citrus lemon makes this an ideal scent for our tropical climate. It settles to a calming fresh scnet that reminds me of newborn babies. Stephie Zubiri, was our host for the day. She exudes a je ne sais quoi, don't you think so? Everyone got to indulge in a hand massage. Here, we are already experienced subtle scents of the Heloise de V. line with their aromatic hand creams. Since I had a few minutes to enjoy, I painted another artwork. It's the artwork inspiration for the scent, Dejeuner sous le figuier or Lunch under the Fig Tree. Au Bord de la Riviere is the fragrance for me. I am never the coloring or the artistic time and it's a revelation how interested I am with it. Heloise de V., I am happy to share, do not test on animals. It is paraben-free, phenoxyenthanol-free, OGM-free, silicon-free, nanoparticle-free, PEG-free, and dye-free. Truly, I am not experienced a more authentic aromatic frangrance than Heloise. A little side note. Valerie told me that the Heloise de V. sampler cards that will be available at Beauty Bar stores are diffusing papers. Not your typical fragrance samplers. You can place it inside your drawers, bags or closets as the scent spritz on it will last a week! You can find Heloise de V. at select Beauty Bar. I was told that it's already available in Greenbelt, Estancia Mall, Shangri-la Mall, and Greenbelt.